Jim Fitzpatrick turned seventy yesterday. I was planning on writing this post in honor of that, but decided against it due to work, et cetera. Then today, I decided, "The hell with it! I've been a Fitzpatrick fan since junior high and the man doesn't turn seventy every day. We're lucky to have 'im on this side of the grave and he deserves a (belated) post." Jim Fitzpatrick was born in 1948 in a suburb outside Dublin, Ireland. He became active in the city's rock scene early on, creating posters for local bands and cultural events. Eventually, his work was noticed by Phil Lynott, bassist and singer for Dublin's premier rock band, Thin Lizzy. They shared not just a love of rock n' roll, but also of Irish culture and of American comic art, especially the art found in the Marvel comics of the '60s and early '70s. The two became friends for life. That friendship—and Jim's talent—led to Fitzpatrick art gracing Lizzy's third album, Vagabonds of the Western World. His style at that time was heavily influenced by the psychedelic art coming out of San Francisco and by Marvel Comics' art, especially that of Jack Kirby. This showed in the various artworks Fitzpatrick did for the album. His promo poster for the Lizzy single, "The Rocker," depicts Phil Lynott on a proto-Judge Dredd sci-fi motorcycle. Typical Fitzpatrick understatement, since Hackensack folded after one LP and Thin Lizzy went on to become one of the biggest hard rock/metal acts in the world. Jim would paint the majority of Lizzy album covers until the band ended in 1983. Philip Lynott was a massive fan, as I was myself, of H.G. Wells, author of War of the Worlds, then a fine 60s movie, and of a Marvel comic spinoff called Killraven. He asked me to create an image to go with my ‘OverLord’ graphic for the cover of Jailbreak and include the tripods from the movie and the comic with Philip and the band fleeing from the blasting rays as they broke out of this futuristic jail. Together we worked on the imaginary story of ‘The Warrior’ that Philip had in his mind and I reworked the roughs to reflect this idea until it all held together. The influence of another great American comic book artist we both loved, Neal Adams, is all over this. Fitzpatrick would go on to do several more covers after Jailbreak, but following the poor sales of 1981's Chinatown—due to problems in the band, exacerbated by drug abuse—the record company would no longer let Lynott decide who did the cover art. I've heard rumors of a never-used Fitzpatrick painting for Lizzy's thunderous swan song LP, Thunder and Lightning, but I've never seen anything to confirm it. I'm sure it would've been glorious and far better than what fans actually got. Fitzpatrick art would not grace the cover of a metal album again until 2002. 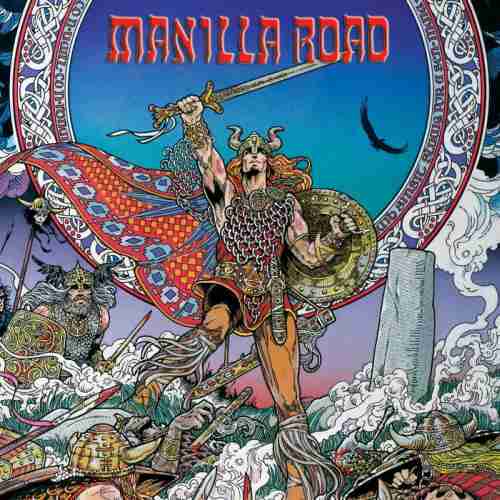 The late, great Mark "The Shark" Shelton and the mighty Manilla Road chose Jim's art from the cover of The Book of Conquests to emblazon their pile-driving CD, Mark of the Beast. I was approached by DarkThrone last year, 2012, to allow them to use my painting “The Battle of Moira” for their new album cover for The Underground Resistance, a classic Black Metal band album. Back in the day I loved Trash Metal, Speed metal and pretty any kind of raucous rock music so I knew this would be a good one except for the fact that money was tight, very tight. In the end I agreed a small fee so the project could go ahead and besides I loved the music. Despite the bad rap Black Metal gets in the media it is not neo-Nazi stuff and as far as I am aware and having checked via the web I am pretty sure that does not apply in any way, shape or form with DarkThrone. Spoken like a true rocker. *Check it out in the Thin Lizzy art gallery below.